If you cruise regularly to the Caribbean, chances are you'll end up in St. Thomas. Its popularity as one of the world's most heavily trafficked cruise ports is well-earned. The island offers something for just about everyone and has the infrastructure that can accommodate a huge daily population influx. In addition to a duty-free shopping scene that's virtually unparalleled, other on-the-beaten-track sites include the world-famous beach at Magens Bay. In September 2017, the Virgin Islands -- along with many other islands in the Caribbean -- were rocked by Hurricanes Irma and Maria. While St. Thomas worked to quickly recovered its most popular tourist destinations, some have sadly closed their doors indefinitely -- including the SkyRide to Paradise Point. Beloved restaurants like Cuzzin's shut down. However, new restaurants and attractions have popped up in their place, solidifying the island's commitment to welcome visitors. Nearly every ship sailing an Eastern Caribbean itinerary includes St. Thomas as a port of call, as do many Southern Caribbean voyages. 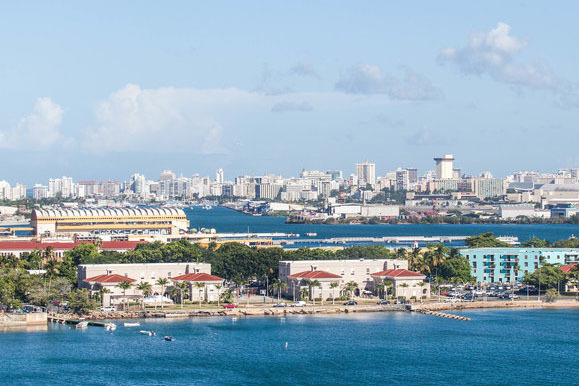 You'll even see St. Thomas on Panama Canal and South American itineraries (when a Florida port such as Fort Lauderdale or Miami serves as a port of embarkation or debarkation). It's not uncommon, particularly during the Caribbean's winter high season, to see six ships or more docked or anchored in a day -- and that can mean an extra 20,000 people mixing into a population hovering in the mid-50,000s. Believe it or not, it's easy to find some respite from the inevitable crowds by exploring St. Thomas' quieter, more undiscovered side -- a lovely historic district, trips to Water Island (the "fourth" and youngest, U.S. Virgin Island), beaches all over the island and fabulous restaurants in Frenchtown. It's also an easy jaunt via 20-minute ferry to tranquil St. John from the town of Red Hook. Even this town has local character (this is where expat residents of St. Thomas spend their time) that's a far cry from Charlotte Amalie's shopping mall vibe. Just taking transportation to the eastern end of the island will give you emotional distance from the hectic pier. Even if it's your first time on St. Thomas, don't be afraid to explore. Although locals drive on the left side of the road, the island has an American familiarity that makes it a perfect introduction to the Caribbean style of life. Attractions, beaches, shopping, golf, water sports -- the island offers a wide variety of activities, with new ones added every year. Even if it's your tenth trip, you're bound to find something fun to do, even if that just means discovering a new beach. Depending on your cruise line and the time of year, your ship will dock at Havensight Pier, the primary dock for cruise ships, or Crown Bay. 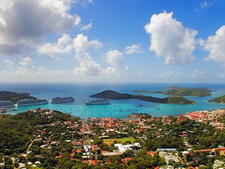 Each terminal is about a five- to 10-minute taxi ride to downtown Charlotte Amalie. If more than six ships call on St. Thomas in one day, your ship could be anchored in the harbor; the tenders will drop you in the heart of Charlotte Amalie. The dock at Havensight, in essence, is a mini-downtown. You'll find more than 50 shops, many of which are outposts of Charlotte Amalie's better-known boutiques, such as A.H. Riise and H. Stern. Also within the expansive Havensight Mall, you'll find a post office, ATMs for Bank of Nova Scotia and First Bank and Havensight Pharmacy. Depending on your plan, your American cellphone might work in St. Thomas without roaming charges. Beyond the immediate facility, the best bargains on duty-free liquor can be found at Kmart -- no lie! Walk up Long Bay Road to the Lockhart Gardens Kmart (you'll notice a lot of crewmembers heading that way -- a good sign, as they often know where to find the best bargains). Crown Bay, on the other side, features a recreated stone sugar mill in honor of the island's plantation era. Crown Bay Center businesses include jewelry, clothing and liquor stores, Passengers whose ships are docked in Crown Bay have more limited options nearby than those docked at Havensight. The Crown Bay Marina has a branch of Gourmet Gallery (and the ferry to Water Island leaves from there). Tickles is a charming waterside pub at the marina with nautical decor (open 7 a.m. to 10:30 p.m. daily). You'll need to head downtown for serious shopping and dining. 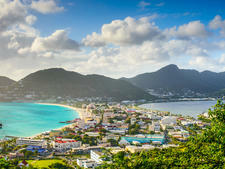 Adventurous types should be hesitant when wandering off the beaten path in Charlotte Amalie; crime can be an issue. 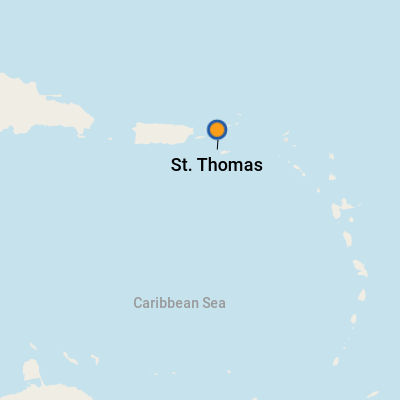 Also, though most ships will dock mid-week -- with Wednesdays in high season accommodating up to six ships in port at the same time -- if you find yourself in St. Thomas on a Sunday, you might discover that many of the shops are closed. Our advice? Head to the beach. By Foot: Because where you're docked -- or dropped by the tender -- is likely close to downtown, it's easy to get a few steps in exploring the shops and eateries of Yacht Haven and other complexes around Charlotte Amalie. A new pedestrian center is in the works so walking around town and browsing is even more cruiser-friendly. However, if you want to head to the beach or get to other major attractions, you'll likely need some wheels. By Taxi: Though they exist, individual "cabs" are unusual. In most cases, you'll be shepherded to a van or safari truck that's heading to the vicinity of your destination -- and might make multiple stops on the way as locals ask the driver to let them off. You'll pay a set price per person. Tipping is recommended when a driver is particularly helpful or knowledgeable, but is not required. Taxi drivers like to load up as many people as possible and travel to on-the-beaten-path tourist sites. If you want to veer off that path, you might have trouble finding a driver to take you. If this is an issue, we recommend you rent a car. By Car: At the cruise ship dock, Avis (340-777-8888) and Budget (340-776-5774) have outposts; reservations are recommended. In downtown Charlotte Amalie, try Dependable Car Rental, with free pick-up and drop-off services (800-522-3076). From Crown Bay, the nearest car rental offices are at the airport (a five-minute taxi ride); Hertz (340-774-1879), Avis and Budget have desks there. Discount Car Rental is next to the airport (877-478-2833). Remember, drive on the left. It takes a little while to get the hang of it. Also, hand use of cellphones while driving is against the law. Currency is the U.S. dollar, and ATMs are readily available. English is the official language, but you might hear French Creole or Spanish spoken, as well. St. Thomas features a wide variety of restaurants and beach bars. Most cater to American tastes, but you can find one or two spots that have a more authentic Caribbean flavor, such as Crabbe's and Gladys'. As in St. John, fine dining can be a little hard to come by at lunch during weekends. The same classic tipple -- the bushwacker, a frozen concoction of creamy liquors -- is also popular here. Get yours at the Drunken Clam. Duty-free shopping in Charlotte Amalie is an easily walkable mecca. Stores are primarily located on Veterans Drive and, running parallel behind it, Main Street. Barkers occasionally attempt to beckon you into shops (they're paid each day based on the store's sales), but are generally less intrusive than in other Caribbean ports. While St. Thomas enjoys a reputation as a duty-free paradise, it's not quite the bargain it used to be. So, it pays to comparison shop. In the market for a camera, we found the prices to be comparable to those found at Best Buy and more expensive than on Amazon -- with no room for haggling. Highlights include A.H. Riise (37 Main Street; 800-524-2037), a variety of boutiques selling high-end perfumes, jewelry, antique maps and liquor (they'll deliver your bottles to your ship on request) -- all in an elegant setting. Down Island Traders (Veterans Drive; 340-776-4641) specializes in Caribbean-made or produced foodstuffs, such as spices, out-of-this-world rum cakes, hot sauces and jams, in addition to regional crafts. Del Sol (44 Norre Gade; 340-715-2051) offers T-shirts, hair clips, sunglasses and cosmetics, such as 20 varieties of nail polish that transform into bursts of color when exposed to the sun. The most interesting shops for quality art and crafts are located outside downtown. Must-visits for aficionados include Mango Tango, which has the island's best selection of original art as well as gorgeous teakwood furnishings -- and a humidor with a wide variety of cigars. (Al Cohen's Plaza, Raphune Hill; 340-777-3060; open 10 a.m. to 5:30 p.m. Monday to Saturday.) If you're interested in serious arts and crafts shopping, rent a car or hire a driver for the day -- or, consider visiting St. John, known for its art collectives. Also, check out elegant boutiques for apparel; Nicole Miller and Tommy Hilfiger are among the well-known names with shops downtown. Other fashion finds include Local Color (Veterans Drive; 340-774-2280) for great casual cotton dresses and the Bambini Art Gallery (Back Street; 340-775-4766) for all kinds of pop art. Otherwise, price shop at so-called "bargain" shops like Perfume Palace, Royal Caribbean (electronics and jewelry), Diamonds International (jewelry) and Little Switzerland (imported china, crystal and jewelry). At Vendors' Plaza, locals hawk straw hats, tropical-print sundresses and T-shirts. Rum cakes and rum balls made with Cruzan rum (produced on neighboring St. Croix) are popular edible treats that can be found in many souvenir shops.